I have been experimenting with cooking green lentils in wine, and I’m pleased with the results. I also love sauteed red peppers and onions as a topping . Green lentils are a good source of protein, and this recipe makes a hearty dinner. Think no-guilt comfort food. Be sure to rinse and sort the lentils before cooking to remove anything that isn’t a lentil or just looks odd. You can use red or white wine. I found white wine sweetens the dish. If that’s not desired, use red. Ever since the Parmesan cheese hubbub, I buy and grate my own. Not only do I know it’s all cheese, it also tastes better. Rinse and sort the lentils. Add the lentils, water, wine, pepper and oregano to a pot. Stir and bring to a boil. Once the mixture boils, reduce heat to simmer for 30-40 minutes (until liquid is absorbed). Stir occasionally. 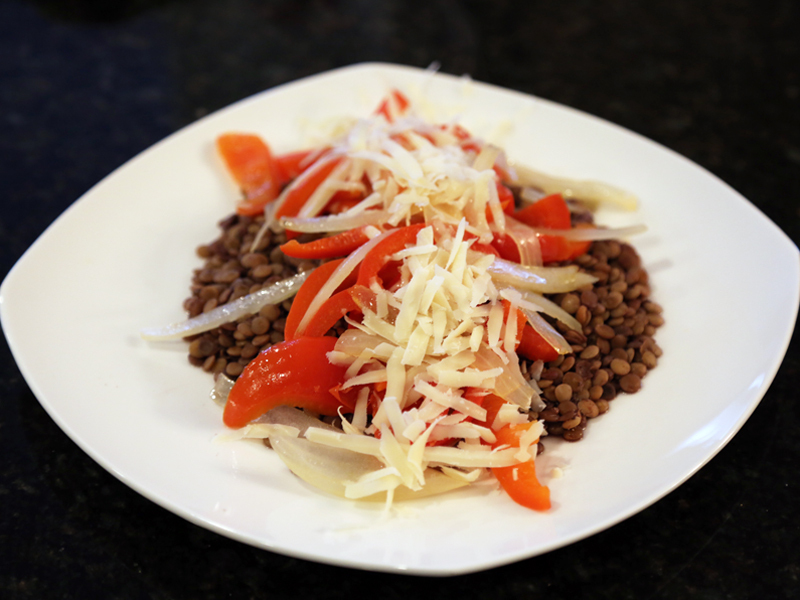 During last 10 minutes of cooking the lentils, saute the peppers and onions in olive oil in a pan over medium heat. Serve with vegetables on top of the lentils. Sprinkle cheese on top. Carrie is the author of the Wise Taste food blog. No Replies to "Lentils with wine and red peppers"